The Catalan Pyrenees (Pyrénées Catalanes) is an area in south-eastern France and is made up from the departments of Ariège in the south-eastern corner of the Midi-Pyrénées region and Pyrénées-Orientales of the Languedoc-Roussilon region. The Catalan Pyrenees as its name implies is very close to the border with Spain and benefits from a sunny exposure for most of the year due to its proximity to the Mediterranean Sea. It also surrounds the tiny Spanish exclave of Llívia, and thus has two distinct borders with Spain. It is an area rich in history, traditions and legends, and is a very diverse area in terms of its landscapes, climate and even its lifestyle. The people here are very proud of their history, bound by a sense of belonging, and the welcome is always warm and friendly. 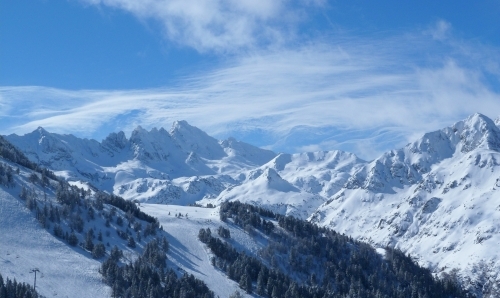 Looming gracefully over the area, the snow-tipped Pyrenees form a mighty natural barrier which you can ski and hike, making use of a range of ski centres and vast stretches of natural parkland. Imposing peaks reach more than 3400m, while fierce rivers cleave the green valleys; tucked away in these valleys and clinging to the mountains are centuries-old Pyrenean villages, collectively forming an open-air rural museum of early medieval architecture. 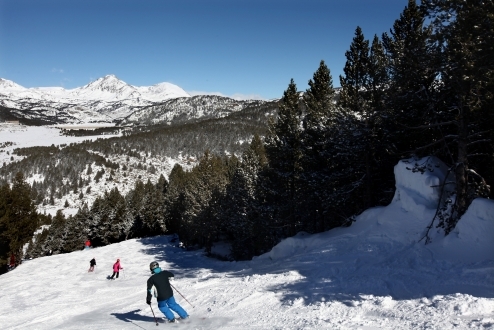 Here you will find world class ski resorts such as Ax 3 Domaines, Font Romeu and Les Angles that have produced National, World and Olympic Champions - a testament to the terrain the area has to offer. 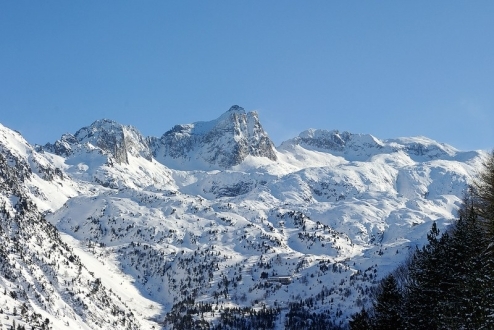 There are an abundance of activities in the Catalan Pyrenees in winter time. As mentioned, skiing and snowboarding is a top winter past time here but there are many other snow based activities such as husky sleigh rides, sledging, snow tubing, piste-basher rides to mention but a few (see individual resort pages)! The resorts here are very family orientated but have much to offer in terms of challenges for the adventurous skiers and hikers. The Nordic sports of cross country skiing and snow shoeing are very popular in most Pyrenean resort and most of them have dedicated Nordic areas. 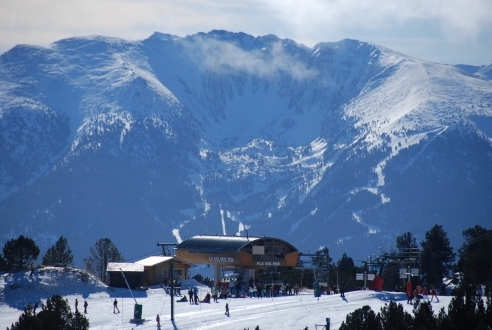 The premier Nordic ski area in the Pyrenees is based in Font Romeu and features an impressive and visually indulgent 111km of trails that will keep even the keenest of enthusiasts busy for quite some time. Amazing panoramic views, beautiful gladed pistes and picture postcard mountain scenery are what is on offer in reward for your efforts. The Catalan Pyrenees has a wealth of natural and historical attractions. The Pyrenees have a plethora of protected areas where you can see and discover the area's exceptional flora and fauna such as the famed Animal Park in Les Angles where you can see brown bears and wolves throughout the year. With more than 500 religious, civil and military monuments, thousands of works of art, the department of Pyrénées-Orientales is a land of discovery and a real open air museum. The Regional Natural Park of the Catalan Pyrenees is the first regional park on the Pyrenean range and was established in March 2004. 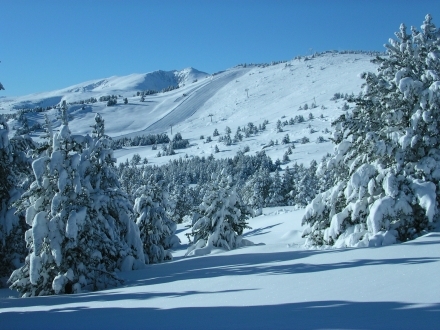 A rich territory of seven nature reserves and three “Natura 2000” sites, it extends over 138,000 hectares and stretches from the lowland valleys where fruits and vegetables are plentiful up through the scrubland and Mediterranean forest to the highest peaks of the Pyrénées-Orientales. The entire area of the National Park is a favourite destination for hikers and mountain enthusiasts. A more leisurely way to see the Natural Park is by taking a ride on the Yellow Train of Cerdanya (Train Jaune), affectionately called the "Canary". A symbol of Catalan country, the train runs from Villefranche-de-Conflent (427m) to the station of Latour de Carol Bolquère (Font Romeu-Pyrenees 2000) - the highest station in France - over a distance of 63km and an altitude gain of 1200m. Constructed between 1903 and 1911, the line passes through 19 tunnels and over 2 impressive bridges (Pont Gisclard, Pont Segourne). The Pyrenees have always had a well-established link to well-being and perhaps the most historically renowned reason for this is its natural hot springs. Towns were often built around these spas due to their therapeutic importance in Victorian times when spa tourism rose to prominence, most notably in Ax les Thermes. The springs at Ax were developed in the medieval period on the orders of Saint Louis to treat soldiers returning from the Crusades afflicted with leprosy. A visit to the Catalan Pyrenees would not be complete without a visit to one of the many spas - perhaps one of the most renowned being the St Thomas les Bains thermal baths near Font Romeu and Les Angles which are set in a stone amphitheatre. Ask any Catalan about well-being and you will most certainly be told about the delights of food and drink within the region. Gastronomy here is as important as the natural and cultural heritage. The cuisine draws naturally from the historical Catalan presence in the area, so dishes like paella (rice dish), cargols à la llauna (snails) and calcots (green onions) are prevalent in the restaurants, especially at important dates such as the various saints feast days and cultural festivals. The geography of the area leads to a distinct divide in the cuisine; the mountainous areas to the south prepare dishes using ingredients that grow naturally and are produced in the environs such as olives and goats cheese. Fish is also very popular in the area due to the proximity of the Mediterranean Sea - with Collioure being famous for its anchovies. The area is famous for its wine with the predominantly red grape varieties grown all over the department, regional specialities such as Muscat de Rivesaltes and Grenache-based Banyuls are sold everywhere in the department. Other wine varieties to try in the area are Macabeu (mildly acidic young whites) and Malvoisie (spicy full-bodied whites). Festivals abound in the area over the summer and winter months, celebrating the rich cultural and natural heritage. Perhaps the key event in the calendar, and the biggest festival of the Languedoc-Roussillon region, is Les Déferlantes d'Argelès-sur-mer. Set under the Catalan sunshine between sea and mountains in the beautiful Parc de Valmy Argeles-sur-Mer, you can applaud some of the biggest international and rising stars of the pop rock scene. Thermal Spa Resorts: Four (Ax les Thermes, St Thomas les Bains, Dorres, Llo). 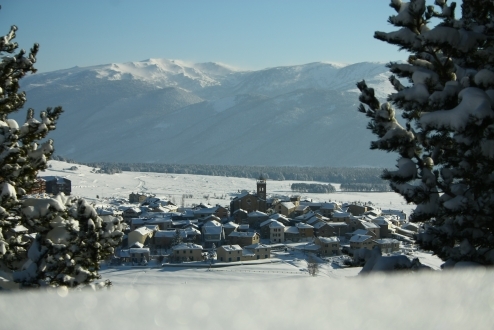 The authentic mountain village of Les Angles has one of the best ski areas in the Pyrenees and a state of the art Live (snow) park. 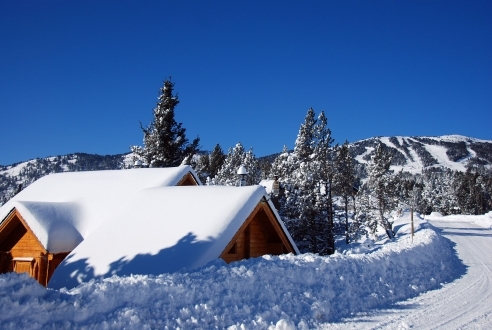 Proud of its Catalan roots, its 50 km of trails offer picturesque views of its quaint Catalan churches and its forests and lakes whilst the battalion of snow cannons and its excellent exposition mean great snow conditions. 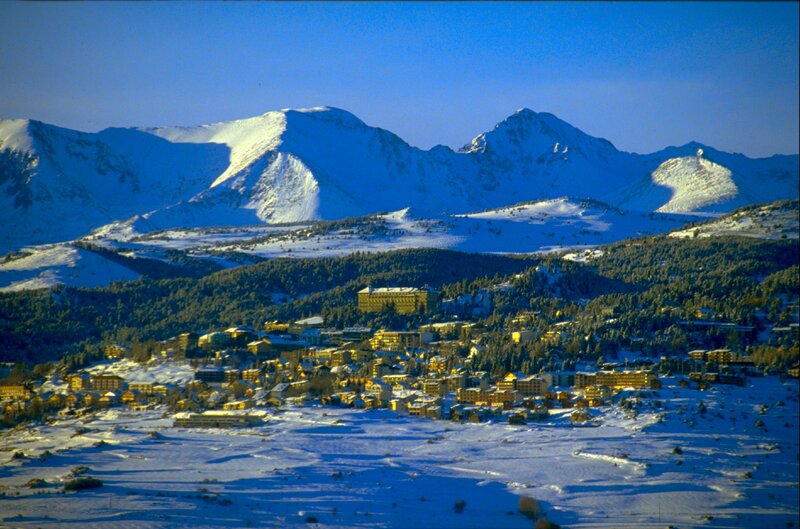 Font Romeu is a small and lively family ski resort in the heart of the Catalan Pyrenees just 19km from Perpignan. With its close proximity to Spain and Andorra, it is renowned for its sunny days and warm Catalan welcome. 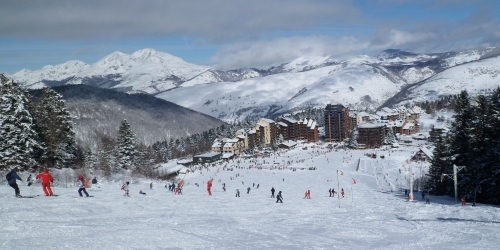 The ski resort, “Pyrenees 2000” is a typical mountain resort offering high altitude skiing, excellent snow making facilities and a state of the art snow park.